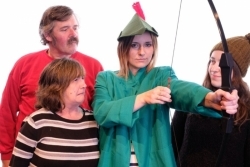 See your old favourites in this uniquely Davenham interpretation of Peter Nuttall's pantomime. Meet strangely female versions of Friar Tuck, Willy Scarlet and Little Johnson, an oddly male Molly, and a Roberta Adair of completely uncertain gender; throw in a nasty Sheriff of Davenham and a nice Maid Marian and then of course, a gallant King Richard the Lionheart. It's going to be a lot of fun, so why not join us at Davenham Theatre?